A line of thunderstorms moving across Texas brought bring severe weather to the Deep South on Tuesday. Heavy rain moved into North Texas Tuesday morning and is expected to end before midnight. The National Weather Service issued a Flood Warnings for Dallas, Collin, Henderson, Hunt, Navarro and Rockwall Counties. The National Weather Service also issued a wind advisory from noon Tuesday to 4 a.m. Wednesday. NBC 5 Meteorologist Grant Johnston expected a north wind to get much stronger during the afternoon with wind chills down in the 30s. Storms in South Texas left thousands of people without power and windows broken after hail the size of golf balls damaged some buildings, but no one was hurt after the bad weather Monday night, according to the Kinney County Sheriff's Office. The bus driver suffered minor injuries during the accident Tuesday morning, Houston Independent School District spokeswoman Lila Hollin said. No students were on board during what's believed to be a weather-related crash, Hollin said. The school bus ended up on its side atop an embankment. 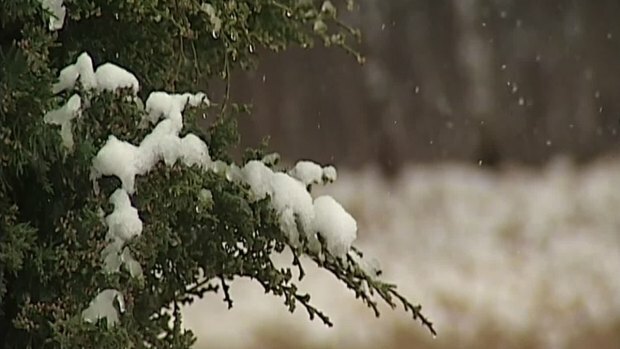 Light snow fell across the Texas Panhandle Tuesday morning. Light snow fell across the Texas Panhandle. Residents in Amarillo woke up to light snow and heavy fog Tuesday morning. Visibility was less than a mile at times. By lunch, the precipitation turned to sleet and northerly winds picked up. Now, more than 7 million people in parts of five states -- Louisiana, Mississippi, Alabama, Florida and Georgia -- are in an area of moderate risk for a few strong tornadoes and other severe weather Tuesday, the Storm Prediction Center in Norman, Oklahoma, estimated. As the storms move into southeast Louisiana on Tuesday afternoon, forecasters say the severe weather will occur from the Baton Rouge area east across the parishes north of Lake Pontchartrain. Schools across south Louisiana and Mississippi canceled classes ahead of the storm.